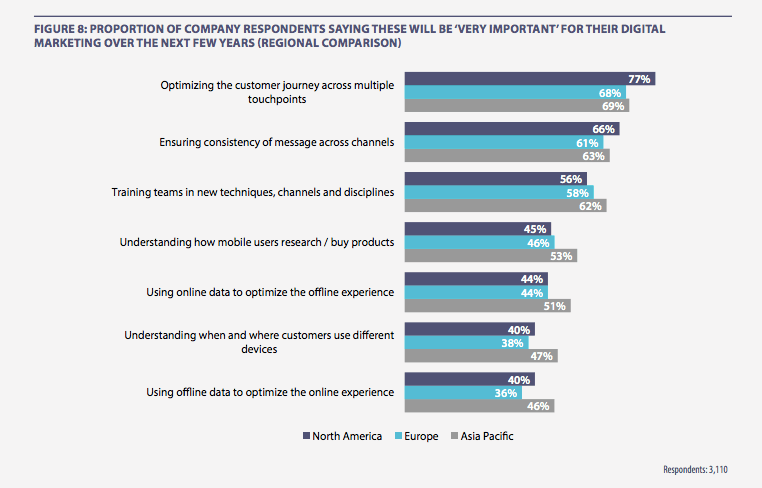 The era of personalization is upon us, but it’s under-delivered…so far. With the right mix of tools, meaningful marketing personalization is possible, but it tends to involve several teams and too much time. Customer data platforms (CDPs) are set to change that dynamic. Customer data has long been the valuable asset a business has, but – even now, in 2018 – most first-party data is siloed off in different teams, with IT specialists sitting between mountains of data and the teams across the business that maximize its potential. There are a number of reports and surveys that bear this out – and show that businesses want to address it sooner rather than later. The numbers don’t lie – your IT teams are spending too much time on data preparation, and they’re not happy about it. A survey of data scientists conducted by CrowdFlower found that 60% of their time is spent on data preparation, and 57% of respondents said data preparation is the “least enjoyable part” of their jobs. Leaving aside the question of employee morale, these numbers are shocking. With the right system, all of this data prep work can be achieved algorithmically and can be delivered in real time to marketing teams via CDP. 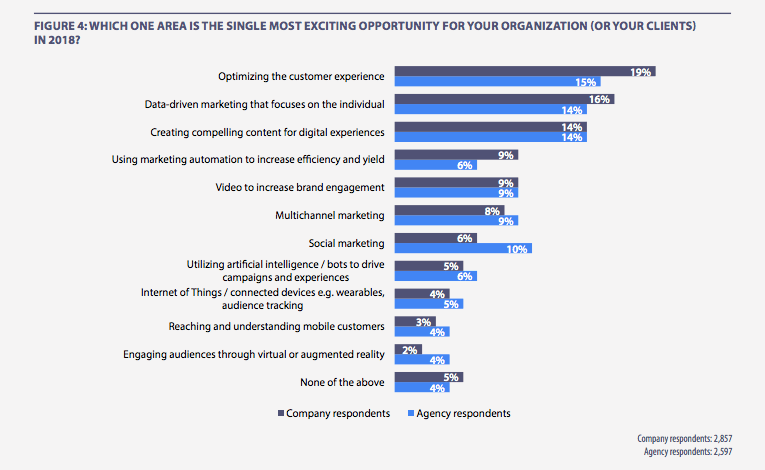 Marketers will have their data prepared for them, based on the company’s entire, unified database, and IT teams and data scientists can get to work on things that both matter to the business and make them want to get up for work every day. Data activation is the missing piece. We’ve spoken with marketing teams that routinely wait several weeks for data mining requests and custom audiences – losing valuable potential business opportunities. According to Adobe’s 2018 Digital Trends Report, business leaders are prioritizing these issues. The top issues here – multiple touchpoints, online and offline informing each other, cross-device intelligence – are all exactly what a good CDP solves. With a CDP, marketers have rich customer views at their fingertips, and they can deliver content to customers at every point in the customer journey. All online and offline behavior data is unified with sales, finance, and all of your other data sources, and it’s actionable – no IT team requests, no wasted time on data prep. It’s not just that companies view these things as important, they’re excited about what they can in the space. The top four responses to this question are all CDP-related, even if marketers don’t yet know it. Detailed individual customer views have become the digital gold standard for marketers – it lets them target rich custom audiences with content tailored specifically to them. This puts customer lifetime value (CLV) at the forefront. An easy-to-use CDP built over an ETL database lets marketers target more effectively across the sales funnel based on every piece of data your business has. Acquire new business more efficiently, nurture repeat customers, and deliver deals and rewards to your most loyal users – all without a single data mining request. Data governance means a few different things, and the benefits of unified, standardized data go beyond revenue in-revenue out operations. Regulations are always changing, multinationals have to work across borders with sometimes wildly different regulatory environments, and one breach can mean millions (or more) in market value. Complying with these regulations is often at odds with requests from teams that are trying to be more data-driven on a daily basis. According to the Adobe report, companies are pretty confident about how they manage their data. A full 91% of respondents say they are in compliance with data protection and privacy laws like GDPR in the EU. A unified database built on a compliant system solves this problem. As everything is based on integrations with the ETL database, any service changes or data flow issues can be managed at that level. All of your data is both housed securely and standardized – and changes to connected systems are reflected across the entire database simply and efficiently. The confidence level went down when the respondents were asked about the workflow portion of things. Time is by far the central business expense for almost every company in the world, and inefficient workflows can cost companies dearly – stifling action and innovation. A CDP eliminates workflow bottlenecks and allows your teams to get to the work of doing business. An effective CDP will transform the way your business works far beyond the immediate benefits to your marketing and IT teams. Your data will be truly democratized, and actionable across the organization – from sales and marketing to finance and compliance. Your business will be better for it. Jana is the co-founder and CEO of Meiro. She is passionate about data, tea, art, diversity and her non-profit initiative @Shelovesdata. Every month or so we round up the latest news in the world of data, events, other resources, and a lot more. By data nerds, for data nerds.